So, those who were paying attention will remember that I recently announced the imminent release of my new cookery book – Some like it hot! At the moment we are well on track for our scheduled release at the end of July. The recipes have all been compiled and finalised, pictures have been taken and a lot of very, very tasty food has been consumed! The only real sticking points have the foreword and the cover. I think I must have gone over each about a dozen times at least! Still as of late last night I have finally settled on a cover design which I actually like, hoooray! All that remains now is to polish off the foreword and give everything a quick once over. Some like it hot! will be available in both Kindle/ebook format and old-school dead tree format via Amazon and selected book stores in the UK and Ireland before gradually spreading from there to conquer the World…. Stay tuned closer to the time for a chance to win some free copies. Well if you thought that the Bhut Jolokia was too hot to handle then be prepared to be blown away by the new kid on the block…..The Moruga Scorpion! Jim Duffy from Refining Fire Chillies grew them out in California, and as of earlier this year (February if memory serves) they have now officially been crowned the Worlds hottest chilli at an average of1.46 million scovilles by New Mexico’s State University’s Chile Pepper Institute. The flavour of the habaneros is great and comes through strongly, really fresh and fruity. The heat is pleasant, more than enough to notice but not enough to destroy your taste buds for days. To say I really, really like this sauce would be an understatement of epic proportions. If I had to pick just one table sauce, this would be it. Kudos Danny Cash! Great sauce 5/5 in my not so humble opinion. As you may or may not know I like spicy foods, hot sauces and pretty much all things chile related. 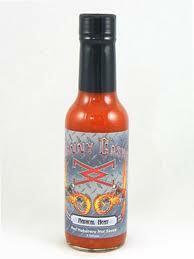 In fact there are very, very few products in the realm of firey foods that do not have me salivating. However even thinking about Pure Evil 16 Million SHU Capsaicin Drops from Texas Creek Products has me breaking out in a sweat! I have tried a number of pure capsaicin products/extracts in the past and have never really been that much of a fan, there just seems to be way too much pain in relation to the amount of pleasure. That said when someone is kind enough to send me such a thoughtful gift it would simply be rude not to give it a try…. According to my Fedex tracking details my very own bottle of liquid pain is about 3 days away from touch down. Guess I should started stocking up on milk and toilet paper. Ah Indian food, where would I be without it! Vindaloo is a Goan dish, heavilly influenced by the Portugese who settled in the area and left their mark on everything from cuisine to religion, the vin part of the name comes from the liberal use of vinegar in the dish. Traditionally made with pork but this obviously isn’t the case in Muslim areas where it would be lamb/mutton or chicken instead and trust me it is just as good. Heat a dry frying pan and add in the coriander, cumin, cloves, cinnamon sticks and peppercorns. Heat for a few seconds until the coriander seeds just start to change colour. Grind these spices together with the ground ginger, bay leaves, chilli powder, the seeds from 3 cardamom pods and salt. Chop the pork into cubes, add the spices and the garlic to the meat and stir well so that everything is covered. Put in a non-metallic bowl and pour in enough vinegar to just cover (it should be between 2-4oz) leeave the pork to marinate for about 6 hours. Finely chop the onion ginger and chillies. Heat some oil in a heavy bottomed pan and toss in the onions, chillies and ginger and fry until the onions are soft and just starting to brown. 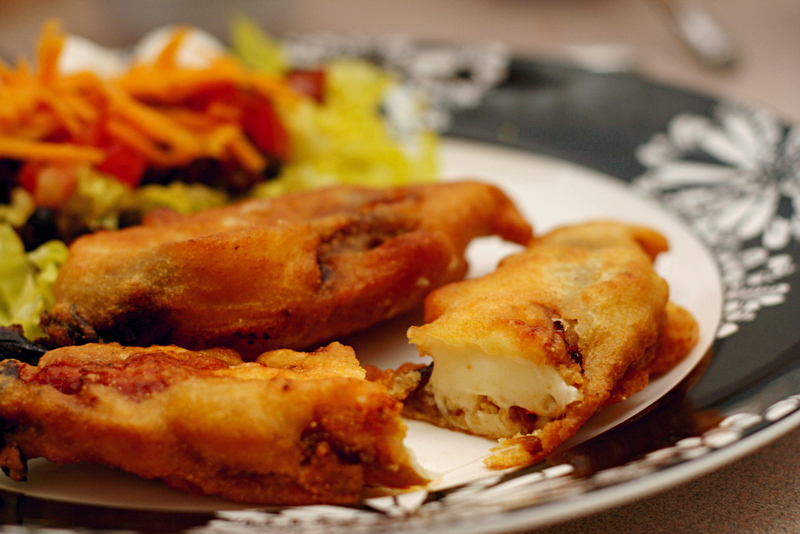 Stuffed japaleños are great for parties and picnics. 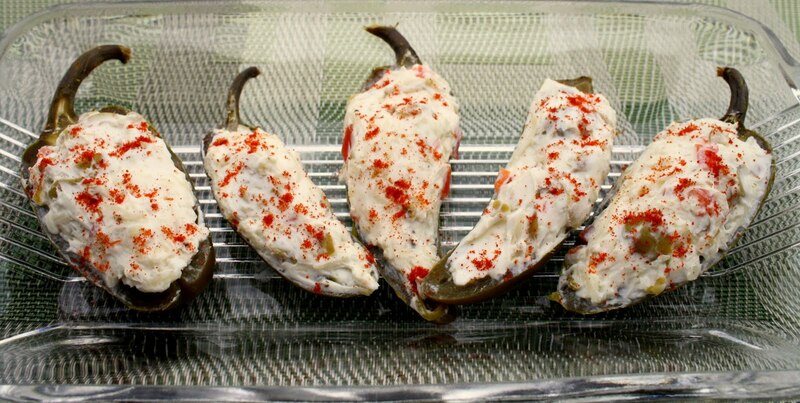 I like these stuffed jalapeños instead of cheese and crackers they are just a much more manly hors d’oeuvres. Halve and deseed the jalapeños. In a bowl, mix together the cream cheese and Cheddar cheese. Chop the bacon in to small pieces (bacon lardons work perfectly for this) and mix in with the cheese. Arrange jalapeños in a single layer on a lightly greased medium-sized baking sheet. Bake for about 30 minutes, but cooking time can vary, so keep an eye on it. When the cheese is brown and bubbling the jalapeños are done.